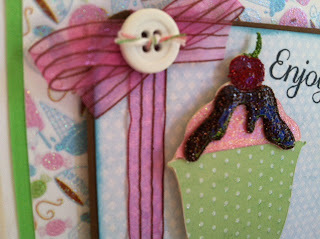 I made this card for the Cool Treats Challenge for My Craft Spot. I really liked the way the ice cream turned out. I have to say I learned the glitter and glossy accent tip from Kimberly at My Craft Spot. Kimberly does a Flashback Friday post on her blog. I love it!! Kate's ABC Cricut. 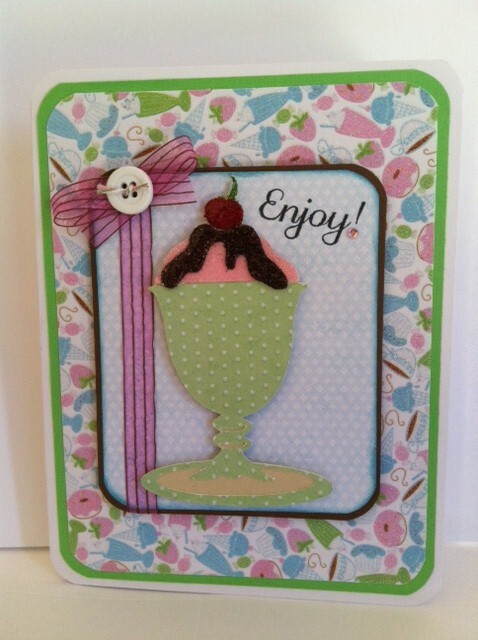 I cut out the sundae at 4"
The glitter background paper and the blue/white paper are from DCWV Nana's Kitchen. Tim Holtz Distress Ink in Broken China around blue edge. Rounded corners, added ribbon, button w/baker's twine and a gem in the exclamation point. Here's a close up of the ice cream. What a yummy looking sundae. My daughter and I had Friendly's earlier this week and it was delicious too. Very cute. Love the glitter trick. YUMMM! Great card! I love the fun paper you used and the delicious looking sundae! Thanks for playing at My Craft SPot! This looks good enough to eat!!! I'm so glad you joined us this week at My Craft Spot!!! What a super card! Your cherry and fudge topping look amazing! Great job!